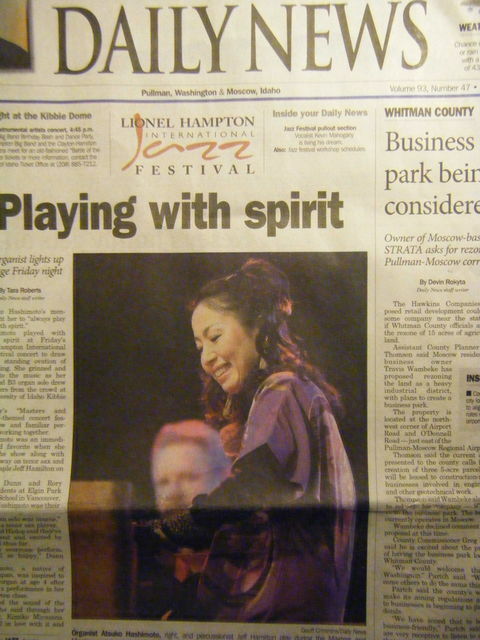 Hashimoto played with enough spirit at Friday’s Lionel Hampton International Jazz Festival concert to draw the first standing ovation of the evening. She grinned and bopped to the music as her Hammond B3 organ solo drew wild cheers from the crowd at the University of Idaho Kibbie Dome. Friday’s “Masters and Mentors”-themed concert featured new and familiar performers working together. Hashimoto was an immediate crowd favorite when she opened the show along with Red Holloway on tenor sax and festival-staple Jeff Hamilton on drums. Alyssa Dunn and Rory Hislop, students at Elgin Park Secondary School in Vancouver, B.C., said Hashimoto was their favorite act. “The organ solo was insane,” said Dunn, a tenor sax player. Dunn and Hislop said they’ve been inspired and excited by the festival thus far. “To see everyone perform, they’re all so happy,” Dunn said. Hashimoto, a native of Osaka, Japan, was inspired to play the organ at age 4 after watching a performance in her kindergarten class. Hashimoto began playing piano and organ professionally at 20. She released her first CD, “Introducing Atsuko Hashimoto,” in 2000. Just last weekend, she released her second album, “Time after Time,” a collaboration with Hamilton. The wide-open spaces of the Palouse and the size and energy of the festival impressed Hashimoto, who had never been to Moscow. She has played with Hamilton for several years, but only listened to many of the other performers on CD. “To meet (Holloway) in person and to play together, the impact is quite different,” she said. Hashimoto said she wishes she’d had a festival like UI’s when she was a young musician.